This is the Audi e-tron. The electric SUV seats five and starts at $74,800. The e-tron will hit Audi dealerships in the middle of 2019, and prospective buyers can reserve one right now for $1,000. This is Audi’s first production electric vehicle and perhaps one of the most significant EVs to be announced since the Chevy Bolt. It has everything Audi buyers expect: Quattro AWD, technology-first cockpit, and a familiar fit and finish. The e-tron is launching to a market with few competitors. It’s most similar to the new Jaguar I-Pace. Both vehicles offer similar technology and creature comforts for a similar price. But in a way, the Audi is joining forces with the Jag to compete with Tesla . The e-tron is packed with a 95 kWh battery pack that powers electric motors on each axle. All-wheel drive is standard, and the vehicle packs two ways to recoup lost energy. Right now, at launch, Audi is not releasing official range numbers and the EPA has yet to certify and release its own numbers. Inside is reminiscent of current Audi SUVs. Drivers are presented with Audi’s virtual instrument panel and several touchscreens. The top center-mounted screen handles infotainment and navigation duty while the bottom is for climate control and text input. The cabin is equipped and outfitted similarly to the rest of Audi’s line, but the design language is unique to the e-tron. It’s clear Audi designed the e-tron to appeal to traditional buyers looking to jump into electric vehicles through familiar means. The e-tron looks and feels like the rest of Audi’s lineup. And that’s probably the point. The vehicle maker took its established formula and plugged it into electric vehicles. The result is something new yet familiar. The outside of the e-tron screams Audi. Sharp headlights, flowing body panels, and an angular, aggressive grill. It looks like a new version of Audi’s mid-size SUV, the Q5. The main design difference comes by way of four small accent lights on the side of the headlights and tail lights. They are designed to look like a battery meter, and the result is a clever, though subtle nod to the e-tron’s electric power plant. Clad in aluminum, the e-tron’s battery weighs about 700 kg (1,543.2 lb) and is comprised of 36 pouch-type cells, the same type of system Jaguar and Chevy use in their electric vehicles, while Tesla uses cylinder-type battery cells. Audi says e-tron’s battery can be recharged to 80% in 30 minutes using a 150 kW charger. The e-tron ships with a Level 2, 240-volt/40 amps residential charger that’s also compatible with 120-volt household outlets. Through a partnership, buyers will have the option to use Amazon Home Services to ready their homes with an installation of a home charger. E-tron buyers gain access to the nationwide charging network, “Electrify America” and can use up to 1,000 kWh of charge over four years. Audi says by 2019 this network will include five-hundred 350kW chargers throughout 40 states. An electric motor is mounted on each axle motor, though both are not used at all times. At moderate speeds, there is a bias to the rear motor. When the rear motor is unable to provide the vehicle with the desired powered, the front motor kicks on. The dual motors and single stage transmission work together to get the e-tron to 60 mph in 5.5 seconds. The tow rating is set at 4,000 lbs which is good enough for a small U-Haul trailer or a couple of jet skis. Audi says official horsepower and torque numbers will be released at a later time. Like other electric vehicles, the e-tron recovers energy through braking and deceleration. But Audi took driving efficiency one step farther. Using navigation and radar and camera data, the e-tron can predictively prompt the driver to release the gas pedal at appropriate times. If the vehicle knows the driver should slow down, it will tell the driver in the name of efficiency. Power is returned to the battery from practically all braking situations whether through natural deceleration when the driver releases the accelerator or when the friction brake system is engaged. Audi says this system is responsible for up to 30 percent of the e-tron’s range. The brakes are electric. When the driver presses the brake pedal, a control unit computes how much pressure needs to be applied, and an electric motor supplies the appropriate pressure. Audi says this system is 30% lighter than traditional vacuum brakes. The amount of energy the e-tron can recover is selectable by the driver via a paddle on the steering wheel. There are three settings. In the highest setting, the e-tron aggressively recovers energy every time the driver releases the accelerator, which allows for one pedal driving. But in the lowest setting the e-tron coasts without any braking resistance. Drivers are presented with few traditional switches and buttons. Most of the controls are contained on two touchscreens. The top, center-mounted screen is 10.1-inches while the bottom is an 8.6-inch screen that’s mounted in a way that the driver can access it while their hand is resting on the gear selector. Both screens provide tactile and audio feedback. This dual screen setup is different from the single, massive screen found in Tesla’s electric vehicles. The top screen handles infotainment, navigation, telephone, and vehicle settings while the bottom is for climate control and entering text for navigation. This layout more closely matches the traditional placement found in other vehicles, which will likely reduce the learning curve often associated with getting in a vehicle with just touchscreens. This dual touchscreen system is not unique to the e-tron. It’s the same equipment Audi employs in its high-end sedans, and will likely trickle down to other Audi models in coming generations. The driver is presented with Audi’s digital instrument panel that the carmaker has been using for several vehicle generations. In this instance, the instrument cluster is presented on a 1,920×720 display with e-tron specific graphics. The driver can configure the screen to display the speedometer, power meter and infotainment screens in various fashions. Buyers can also opt for a heads up display. Audi built a companion app for the e-tron. Through the smartphone app, owners can input navigation destination, set battery charging times and schedule service with local dealers. The Tesla is a head turner while the Audi looks like just another Audi. The Tesla packs autonomous driving modes while the Audi only has adaptive cruise control. The Tesla can seat up to seven while the Audi seats five. And the Tesla can beat exotic sports cars to 60 miles per hour. The Tesla Model X interior feels like something different while the Audi e-tron feels like a new take on something familiar. Both vehicles start out at similar prices. The Tesla Model X starts at $72,100 with a range of 239 miles. The Audi e-tron begins at $74,800 with an unofficial range of around 248 miles. However, to get the extra range in the Tesla, buyers have to opt for pricier packages. A Model X with a 295-mile range starts at $88,600, and the sports-car fast P100D begins at $125,800 — Tesla’s self-driving features cost an additional $5,000. In contrast, Audi offers the same powertrain and battery throughout the e-tron’s trim levels. For $81,700 buyers get the same range as the base model but gain additional creature comforts like a heads-up display, massaging seats and parking assist technology. For $86,700 buyers can opt for the First Edition package that includes larger, 21-inch wheels, limited paint, and interior trim and a night vision mode. The Audi e-tron closely matches up with the Jaguar I-Pace. Jaguar recently announced its electric crossover and is nearing delivery of the first vehicles. Compared to the e-tron, the I-Pace has a similar range, speed, and slightly less interior space. Pricing for the I-Pace starts at $69,500. The e-tron and I-Pace represent a new breed of electric vehicles even more so than a Tesla EV. Both of these vehicles come from corporations with massive manufacturing might and, while they look and feel futurist, they also look and feel mass produced. And that’s a good thing. If electric vehicles are to become mainstream, the automotive giants need to build them at the same level as traditional automobiles. The Audi e-tron will hit the United States in the middle of 2019. Buyers can reserve the vehicle starting today with a $1,000 refundable deposit. When the vehicle hits dealers, it will be Audi’s most expensive SUV and among the most expensive vehicles available from Audi. 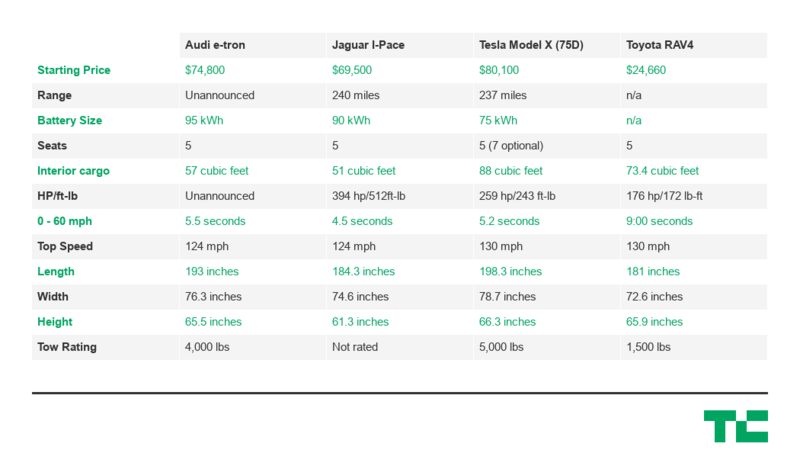 But compared to competitors, the e-tron is priced in the middle of the pack. The e-tron will hit the market at a pivotal time for electric vehicles. Automakers are just starting to stake their claims in the marketplace. Chevy went downmarket with the affordable Bolt. Jaguar is hitting the crossover market with the $69,000 I-Pace. Tesla is the premium player in the field with the Model X. The Audi e-tron sits in a sweet spot between the Jag and the Tesla. The pricing is slightly more than the Jag but is well equipped to stand tall against the larger and more expensive Model X. The e-tron’s success will likely come from consumer awareness. Car shoppers need to know Audi has a new electric vehicle, and Audi seems to understand this. Even before the car launched, the company started advertising the EV with a big-budget TV spot during the Emmys. Since the car doesn’t hit the market for nearly a year, Audi has plenty of time to get the word out. However, that also leaves plenty of time for new competitors to hit the market and for the landscape to shift.